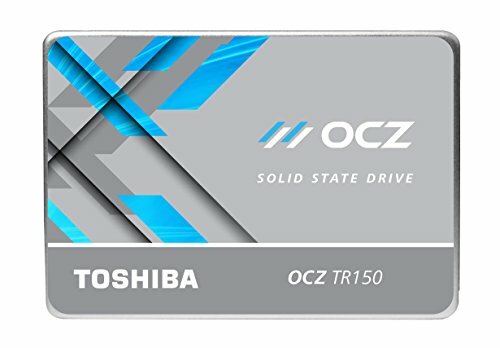 Upgrading from a hard drive should be easy and affordable and that's where OCZ Trion 150 SSDs come in. Designed to optimize and instantly boast the speed of your notebook or PC, the Trion 150 Series leverages premium Toshiba TLC NAND flash to go the distance and deliver a superior balance of performance, reliability, and value that will transform any mobile or desktop system. Up your productivity with the Trion 150 Series and enjoy faster boot ups, file transfers, and system responsiveness. Say goodbye to hard drive lag and get a state-of-the-art computing experience worthy of your time. Upgrading to an SSD can feel like you've purchased an entirely new system- not only because of the enhanced speed, but also the initial investment normally associated with the technology. Trion 150 SSDs balance price and performance so you have enough funds leftover for other upgrades. With 100% Toshiba technology built into every drive, each Trion 150 SSD is engineered for superior quality and reliability, keeping your data secure. The more power-efficient Trion 150 Series is optimized for lower energy consumption which translates into longer battery life to keep you up and running longer. Trion 150 offers plenty of real world performance for all your gaming and productivity applications. No fancy behind-the-scenes tricks, just pure storage performance. Max Read 550 MB/s, Max Write 530 MB/s, Max Random Read (4K QD32) 90,000 IOPS. Endurance for daily usage guidelines is 219 GB/day. 3 year of Shield Plus warranty with Toll-Free Tech Support, 24 Hour Forum Support & Firmware updates. If you have any questions about this product by Toshiba OCZ, contact us by completing and submitting the form below. If you are looking for a specif part number, please include it with your message.